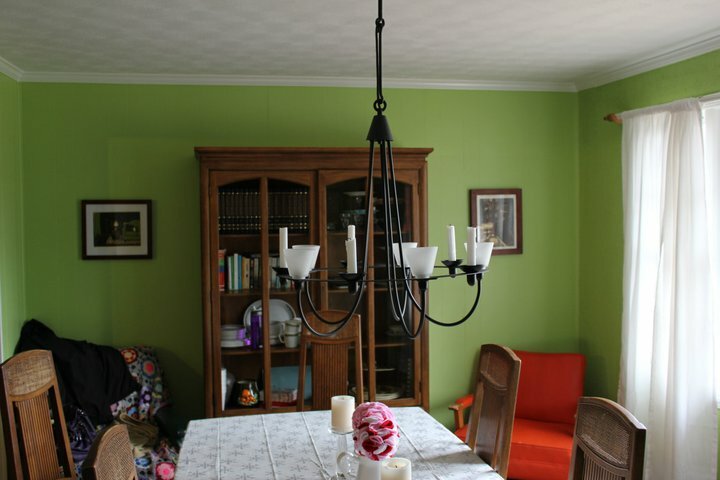 a view of the green dining room- also before we painted the china cabinet so you get a sense of how much better it looks now! Well it was a crazy few weeks especially since part of it was spent at the beach but it’s done and I got all the important things finished! Whew…now I just wanna sleep for weeks..and show of my house while it’s still clean. LOL. It feels so good to have a freshly cleaned house that is empty of a TON of useless clutter. I took several car loads to Goodwill and several more to the trash! So much that we were just holding on to for no reason. We are trying to live a more minimalistic life and it is so rewarding and freeing to move toward that goal. Also my dining room is now a soothing white instead of its previous bright green. I am definitely in a “paint all the things white” mood right now. I love the calming influence that white paint has on things. 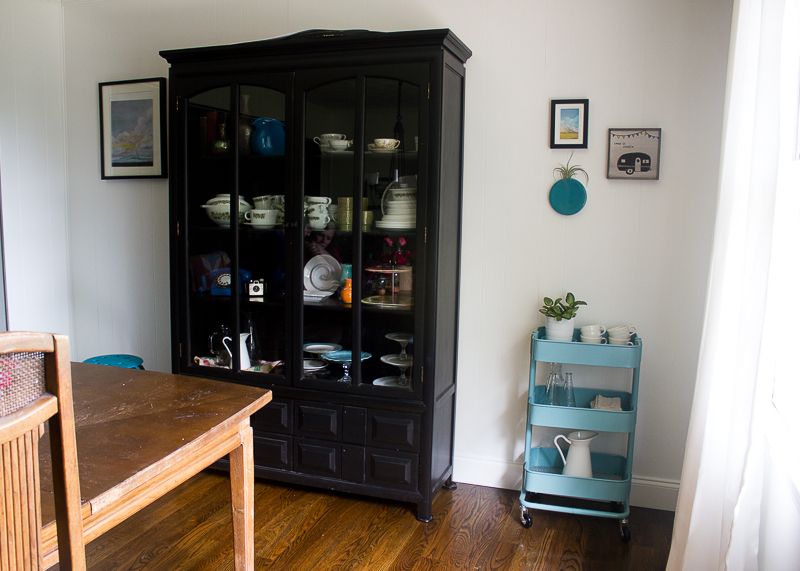 So let’s talk about the dining room projects a bit. I recovered the dining room chairs in this awesome Lotta Jansdotter Canvas print from her Glimma line (I got mine from Pink Castle Fabrics and they don’t carry it anymore but I found some on etsy here) that I’ve had sitting around for several months for this very purpose. Easiest DIY project ever: 1. unscrew the chair cushions from the chair 2. pull the new fabric over the cushion tightly and staple in place 3. screw cushion back on chair and enjoy! 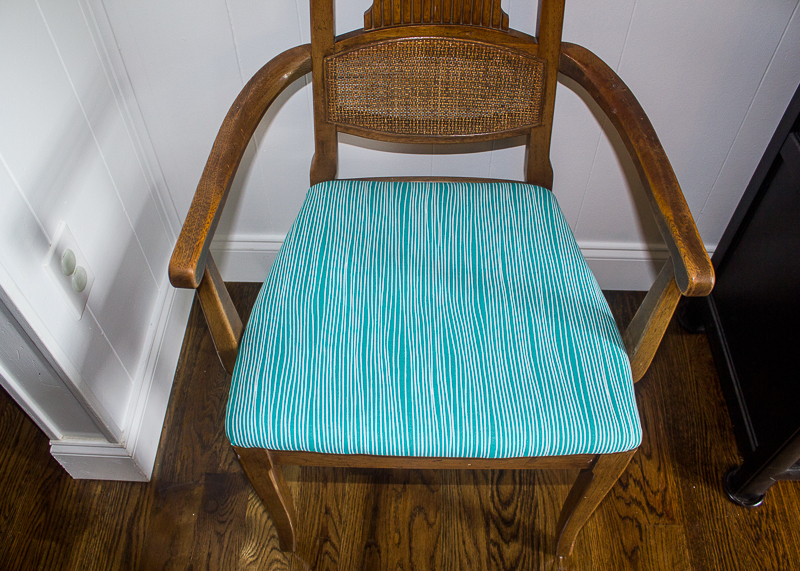 Make sure you pull the fabric tightly or it will wrinkle as the chairs get used. 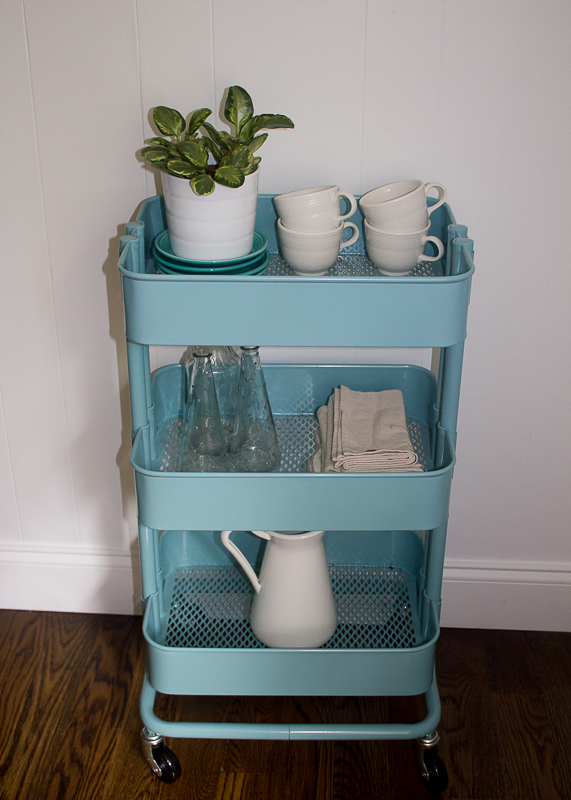 Blue cart is the Ikea Raskog that so many other peeps have. It’s currently housing our cloth napkin stash and some pretty dishes. I’m still waiting on my light gray curtains for the windows but I have some family members making an ikea trip soon so they are going to pick them up for me. The 2 landscape wall prints are by Emily Jeffords (who happens to be local to us right now!) and I highly recommend them for their high quality! The prints actually look like originals. I love how peaceful her work is also. Please forgive the wonky look of the large one- we just got the frame for it and need to go get a new mat for it since the current one is not the correct size- which is why I don’t have a close-up of it. 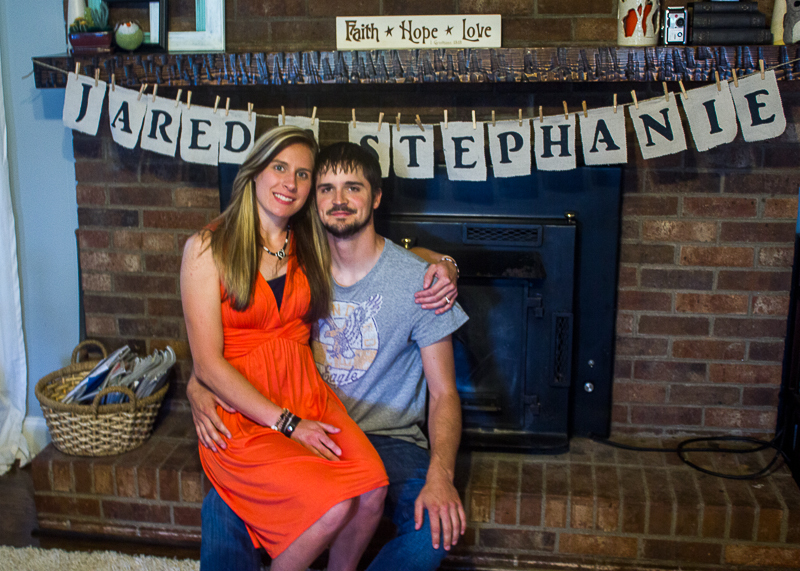 Here’s some fun pictures from the bridal shower. The bride-to-be loves burlap, mason jars and roses so we took those things into account when decorating. 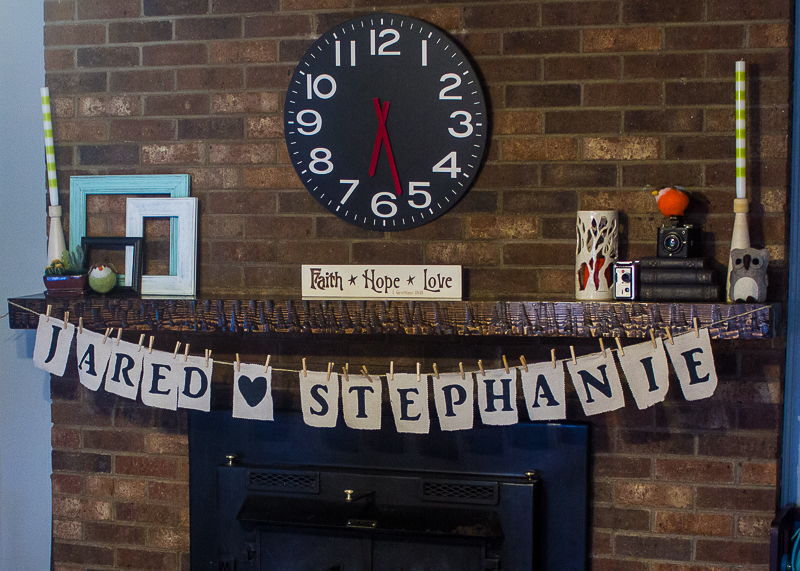 My sister in law made the awesome bunting for the mantel by freezer paper stenciling onto drop cloth. 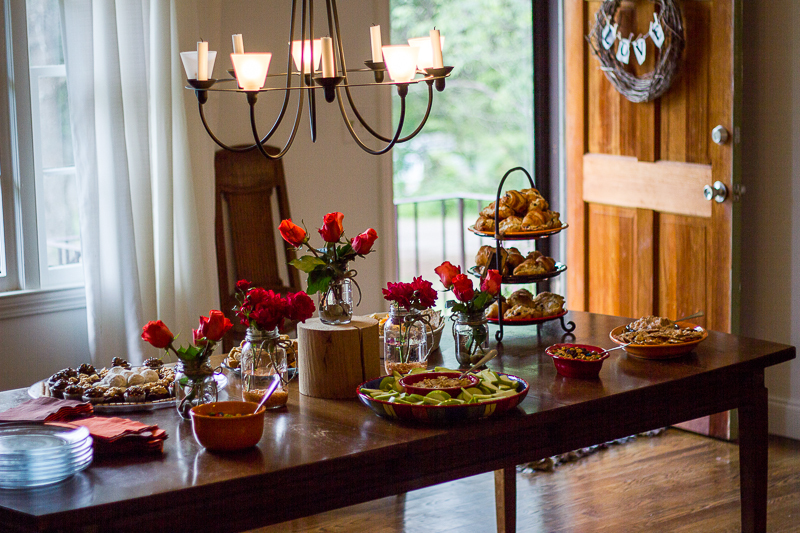 This entry was posted in For the home, Personal and tagged bridal shower, bridal shower bunting, chair recovering, dining room makeover by oliver's fancy. Bookmark the permalink. Looks great! I think you need to come and purge out my house for me! Something I need to work on some more. Feels so good when you are done, but so hard to get rid of things sometimes! This is the kind of motivation I need to clean and declutter etc. Otherwise I am hiding in my sewing room too!! It is all lovely. I have a paint color picked out for my living room. (in my head)..a soft buttery yellow…but can’t find the paint chips to make it happen yet. We need to ‘get busy’. Very peaceful looking dining room, with a bit of a ‘beachy’ feel. Must be the blues. Oh that’s right, we do! I could go to ATL but Charlotte is closer so we usually go there. We should plan an ikea day! I’m always needing to go there for something. 🙂 There’s also a pretty big fabric store called Mary Jos in Gastonia that we should totally visit. 🙂 And yeah, I really want to paint a few more rooms too. It just feels sooo good!